Miami is a city that is one of a few true cultural melting-pots in the world, with a distinctly characteristic environment. Anywhere you go, you will find dozens of languages, and in each language, many sub-dialects and accents as well. It seems as if everyone came from a different place. And that has a simple explanation. They did. With a Latin American flavor, dominated by the Cuban influence, its extremely diverse culture, its great prosperity, and its vibrant, entertainment and beauty, Miami is a unique and amazing place to visit. The tour starts with a stunning view of the Miami Intracoastal Waterway over the Julia Tuttle Causeway to Miami Beach, and down to Lincoln Road. This part of the art-deco district, which was originally envisioned by the main developers of Miami Beach to be a place similar to what 5th Avenue is to New York, or Rodeo Drive to Los Angeles. It is a beautiful outdoor promenade mall with cafes, art galleries, dining and upscale shopping. After a short stop to explore the area, it is off to the next stop. 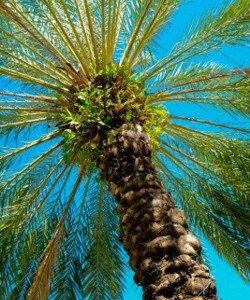 It is just a short cruise through the palm tree lined A1A, to the southern tip of Miami Beach, into South Beach proper. Better known as SoBe, it is a fashion Mecca for people around the world. Modeling agencies, fashion boutiques, al fresco dining, and neon art-deco nightlife, line the streets of Ocean Drive, while fun pulsating Latin rhythms and beach sounds fill the air. It has been a favorite party and relaxation place for the rich and famous, since the time of Al Capone. Miami Beach has been the setting of over 100 full length films, and many TV series as well. Some more notorious ones are Scarface, Several James Bond Movies, Miami Vice, Bad Boys, The Fast and The Furious, Dexter and Miami Ink. 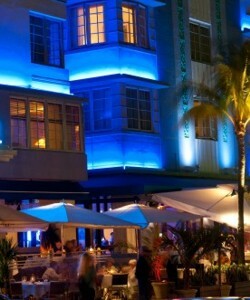 South Beach is a must see for the visitor to Miami. On the return to the mainland over McArtur Causeway, the Miami Cruise Ship terminal parallels the road a few hundred yards away over the bright blue water of the Intracoastal, and the skyline of Miami towers behind it in a majestic backdrop. 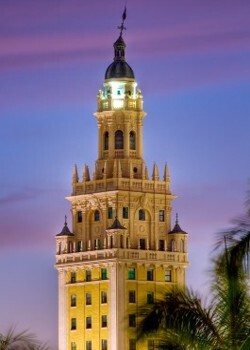 The freedom tower in downtown is an amazing site, originally built in the early 1900s, it is a National Historic Site had been dedicated as a monument to the freedom of the Cuban exiles from communism, and is a part of the cultural heritage of the city. Across the street is Bayside Market place, a quaint waterfront mall with music, sights, and shopping delights. A great place for a refreshing walk. It is always an experience driving along the streets in the downtown area, covered in the shadows of the sky scrapers are hundreds of stores and coffee shops with Latin style foods and beverages. Across the draw bridge over the Miami River is Brickell, the exclusive SE downtown Miami area, the heart of the financial services of Miami, and the opulent Brickell Key with its beautiful high rise condos towers along the shore on way down to Coconut Grove. A few minutes away, are the beautiful gardens of Vizcaya, once a private residence of a very wealthy business man, this historic estate is now a museum that is open to the public, and has become a popular place for weddings and events of the elite of Miami. It is said that one tenth of the population of Miami was involved as labor during the ten years of construction of Vizcaya. The tour continues through the beautiful upscale area of Coconut Grove, past the marina and Cocowalk mall, a vibrant place with lush greenery and fine cuisine, and then on to Coral Gables and Miracle Mile. 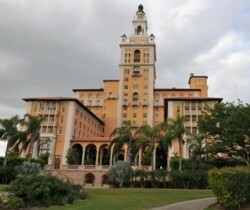 The mansions of the original affluent neighborhood and shopping area of Miami are still stunning today, and the beautiful Biltmore Hotel that has served the area since 1926, is now a National Historic Landmark, surrounded by fountains and golf greens. The final stop of the tour is in Little Havana, the community where a majority of the Cuban exiles of the 1960s came to reside. Its main street is the famous Calle Ocho, which is home of the largest street party in the world, and a local gallery of colorful Cuban art, food, music, and culture. It is a great opportunity to experience the beauty of the Cuban warmth, their lively entertainment, and tasty food staples. All of which are central to what Miami is today. The tour of Miami is a beautiful and fun culturally enriching experience that will broaden your perspective on what an international city is. It is also an excellent opportunity to create memories with friends and loved ones, that will be subjects of conversation and heartfelt points of connection that can last for generations to come.